This Grove - Line finder is designed for line following robotic. 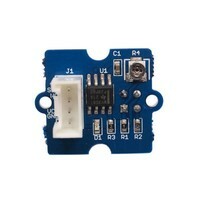 The sensor consists of two parts: an IR emitting LED and an IR sensitive phototransistor. It can output digital signal to a microcontroller which will allow for the robot to reliably follow a black line on a white background, or vice versa.